Emergenetics recognizes that all of us have unique talents, some of which are learned and some of which are inborn and hardwired. Although the test is relatively inexpensive (it is taken online in about a half hour, and the results are immediate), its efficacy is inversely proportional to its expense. 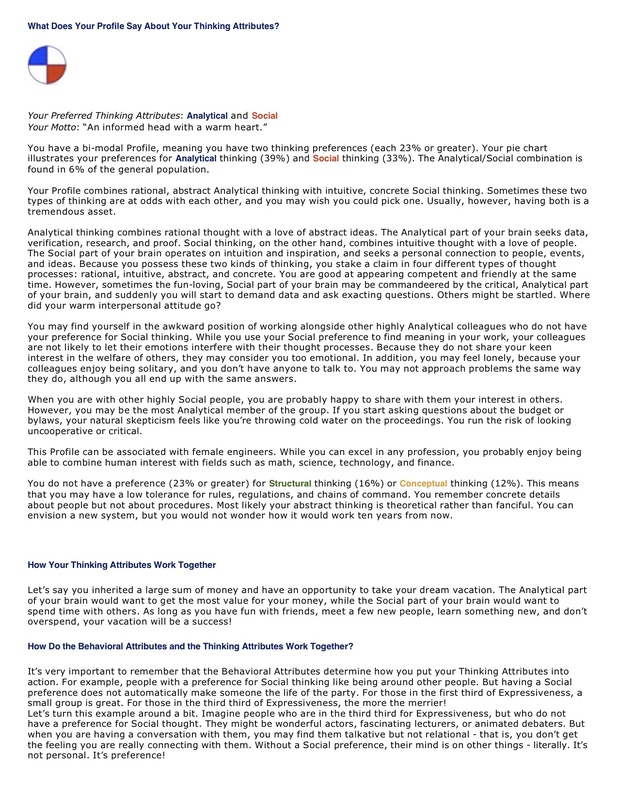 Based on the latest brain-dominance research, the Emergenetics Profile is an invaluable tool for measuring the following four dominant-thinking preferences against a database of 250,000 people who have already participated in the program. Here is a sample profile similar to what you would receive. Along with the profile, you get a 8 page narrative report interpreting how the profile relates to you. Below are a couple of sample pages of a narrative report. Conceptual Thought : This so-called right-brain type of mental activity gives you the capacity to embrace the big picture, providing the creativity and vision to imagine outside-the-box possibilities as well as new ways to accomplish these ends. Social Thought : Also a function of the right side of the brain, this is the intuitive, people-oriented type of thinking so important in empowering others and team building. Structural Thought: A left-brain function, this type of mental activity enables an individual to create an ordered, practical and relatively predictable environment, where the underlying patterns and rules are recognized and appreciated. Policies and procedures are not viewed as the enemy by structural thinkers. Analytical Thought : Clear, decisive thinking characterizes this left-brain mental function. Analytical thinkers are particularly adept at rational, logical problem solving — a skill that explains their enjoyment of math. 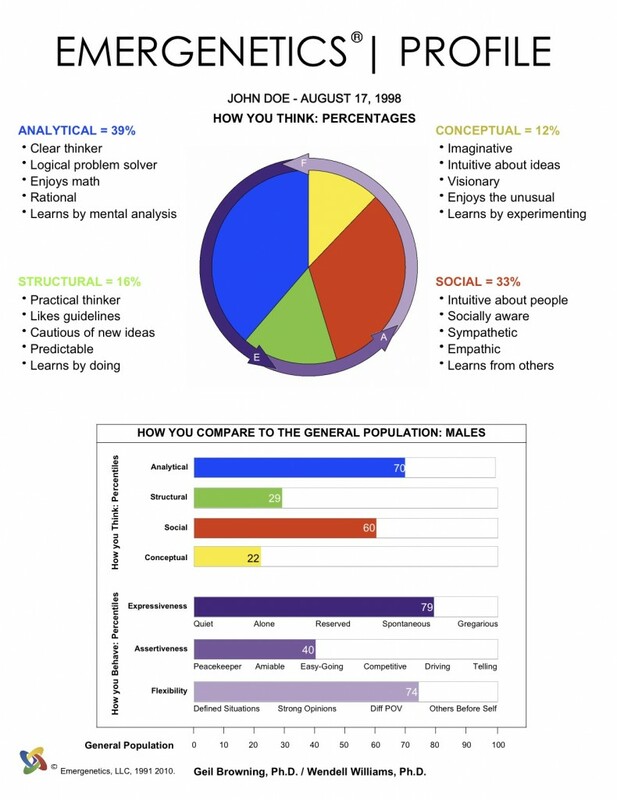 The Emergenetics Profile shows you which thinking styles you generally prefer and which you find less compatible with your character and personality. Understanding your preferences and realizing that your friends, family, or co-workers don’t necessarily approach problems in the same way can make attempts at communication much less frustrating. The Emergenetics Profile also measures three important behavioral attributes: expressiveness (ranging from quiet to gregarious), assertiveness (from peacekeeper to authoritative), and flexibility (from personal rigidity to putting others before self). These three personality traits are important to recognize when moving toward a new career. Improve and enhance your interpersonal communication skills. Increase your understanding of yourself and others. Become more adept at creative problem solving. Improve your ability to assemble the “perfect” team. Promote life satisfaction in yourself and others. Ready to sign up? Click here. Rick has worked with clients in England, France, Ireland, Italy, Switzerland, Belgium, Norway, Sweden, Turkey, Canada, China, Hong Kong, Taiwan, Indonesia, Malaysia, Japan, Korea, New Zealand, Australia, India, Brazil, Chile, Columbia, and the United States. My purpose is to help 1 million people recognize their natural talents and abilities, then help them apply these innate gifts in such a way as to bring meaning and fulfillment into their lives. Rick Duff enjoys a WORLDWIDE CLIENTELE. His services are rendered primarily through phone or Skype consultations. The tests can be mailed anywhere in the world. CALL TODAY (949) 713-3155 to discuss details. Determining what your highest innate aptitudes and abilities are is the smart way to discover a career or college major that fits you well.